As of now, I am a mere forty-eight hours returned from the young and energetic democracy of South Africa – Johannesburg, Durban, and Cape Town – where I met many, many poets and lovers of poetry and as many, if not more, lovers of freedom. Our last night on stage (we did one performance in each city), I bid farewell to South Africa with Robert Hayden’s “Frederick Douglass”. When I read this poem for the first time fifteen years ago, it moved me immediately, and for many reasons, one of which is that I could hear a version of it in the air even before I’d read it aloud. The poem, as compact as it is, has the qualities of the bardic, its repetitions and its catalogues of epithets and appositives. It’s one of the few poems I have memorized, one that I recite to myself in the subway or on line at the bank. Once, I was stalled in the basement of the MiddlesexCounty courthouse waiting to be called up for jury duty. When we were directed to wait in a second chamber upstairs, the bailiffs made it clear we had to leave everything behind – bags, books, notebooks, pens. All I had was this poem in my head, reciting it over and over silently among strangers in a courthouse in New Jersey. With no apologies to strict formalists, “Frederick Douglass” is a sonnet. What better vehicle to address the notion of freedom than a form with a long tradition of austerity. Look how the first line blatantly violates the ordinances of a conventional sonnet – 18 syllables, nearly double that of the strict iambic pentameter line. It bursts out, breaks through the imagined right margin – and not with iambs, but with a predominantly anapestic feel. Not the stately march of ‘unstress-stress’ or one’s resting heartbeat, but the rhythm of running. Hayden dismantles other formal strictures: there is no end rhyme and, more subtly, there is no real discernible turn. Through rhetoric and syntax the poem drives itself from left to right and down the page with a ferocious pace, trades volta for voltage. This is not to say that Hayden recruits only a full-on acceleration. There are graceful syntactical maneuvers here. The visual and rhythmic isolation of “exiled” in medial position and “alien” in terminal position is impeccable, the latter, on the verge of white space, silence, vanishing. These moments, framed by commas, are beautifully timed, i.e. they are natural to the breath, urgency, and energy of the poem. I do want to mention the choice of the word “needful”, which feels musically precise (when we consider the obvious but clunkier alternative, “necessary”). It’s not a word we use much in American vernaculars. For a poem that is about the wish for freedom to be common, the word choice seems to rarify, rather than familiarize, the diction. We have to remember the idealist side to Hayden’s assessment of himself as a “romantic realist”. For Hayden, political, spiritual and personal transcendence is a movement upward. Note the title poem of his collection Angle of Ascent (a tribute to Gabriel García Márquez); note also “The Diver”, whom Hayden portrays as witness to the horrors of the deep, “began the measured rise.” I think, too, that Hayden resists “necessary”, the Latinate word, in favor of“needful” which has Proto-Indo-European roots. The Latin has strong associations to empire, but more importantly the word “necessary” is built with the negating prefix “ne” or “not”, where “needful” ends with an explicit fullness, a brilliant and appropriate paradox – to be full of need. 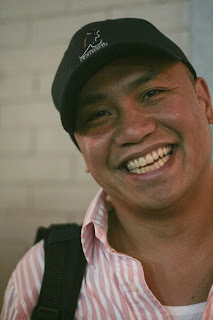 Patrick Rosal is the author of My American Kundiman, winner of the Association of Asian American Studies Book Award and the Global Filipino Award. His first book, Uprock Headspin Scramble and Dive won the Members’ Choice Award, from the Asian American Writers’ Workshop. His poems and essays have been published widely in journals and anthologies, including Indiana Review, Harvard Review, Ninth Letter, Brevity, and Language for a New Century. He has been a visiting writer at Penn State Altoona, CentreCollege, and University of Texas, Austin, and has just returned from touring South Africa with the Urban Voices International Poetry Festival.